A new great tasting variety for the gourmet market. Prince of Orange has a smooth dark red skin and a beautiful dark yellow flesh. 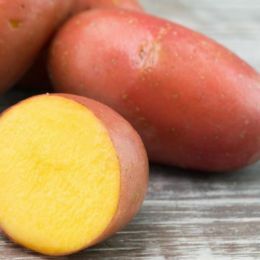 Tubers are oval-long shaped and an ideal size for a fingerling potato. Prince of Orange has fantastic culinary qualities with a delicious creamy buttery taste. Also a variety that has versatility in the kitchen as it is great for boiling, steaming, roasting, grilling, and frying.